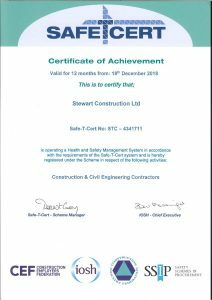 Stewart Construction recognise the prime importance of people and their health and therefore optimum health and safety performance is paramount. 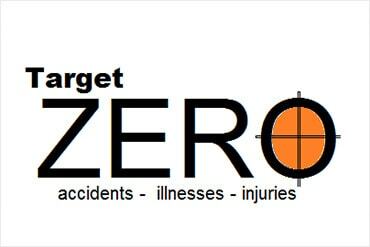 We are committed to ensuring that our Health and Safety Policy is fully implemented and reviewed and a safe working environment is maintained for all employees and for persons not employed by the Company who may be affected by its activities. Adequate Resources Deployed to advance a Safe Working Environment. The Company maintains independent certification that the Occupational Health and Safety Management System conforms to the requirements of OHSAS 18001. It is the objective of Stewart Construction to continually strive to lead the way in quality building and maintain our long standing reputation as a quality contractor with over 115 years experience. Stewart's policy is ensure its customers are provided with a completed project that meets with the required specification, drawings and details as per the agreed contract. It is the responsibility of all sectors in the organization to ensure that the requirements of the Quality Systems based on ISO 9001 are adhered to and that the necessary resources are allocated to establish, maintain and update the Quality System. The Quality System is systematically reviewed and upgraded to ensure continued effectiveness and improvement. Stewart Construction maintains independent certification that it’s Environmental Management System conforms to the requirements of ISO 14001:2004. It is Stewart's policy to implement environmental best practice in meeting it’s contractual requirements and to comply with the Environmental Protection Agency Act, 1992, the Waste Management Acts 1996 and 2001 and the Regulations made under these Acts, thereby complying with EU requirements. Company environmental policy objectives form an integral part of the operating procedures of the company and senior management will pursue these objectives with all staff to continuously strive to develop and enhance these goals. Stewart has quickly recognized the need for environmental change within the built environment and has been at the forefront of this change. Sustainable building projects are very much a part of the Stewart portfolio, which includes delivering the 1st Second Level School in Ireland to be built to Airtight Standards in 2006, and also in delivering the country’s 1st publicly funded BREEAM EXCELLENT Office Block to be procured under a Design & Build Basis in 2010. The leading construction company is currently aiming for LEED GOLD Accreditation for another Design & Build Office Block Project, which is being delivered utilising the Building Information Modelling (BIM) Process. This experience and company policy objectives puts Stewart at the forefront of environmental change within the Construction industry. Our Corporate Social Responsibility policy objective is based on keeping the trust and respect Stewart Construction has earned over our many years in business from our existing clients, personnel, consultants, subcontractors, suppliers and our community and to gain the trust and respect of new clients, personnel, consultants, subcontractors and suppliers and members of our community by continuing to act responsibly and ethically in the communities we serve, thereby protecting a well earned and valued reputation.